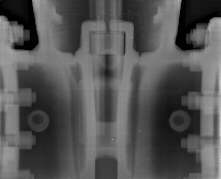 Conventional radiography with film is superior to other NDT methods in many different applications. 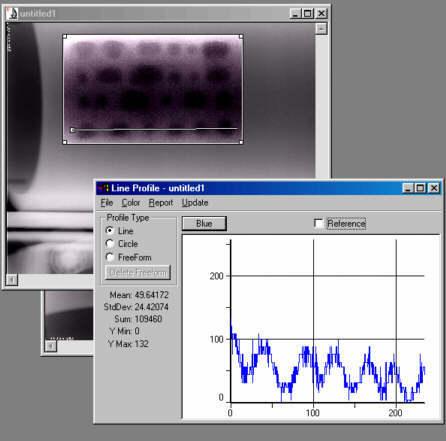 Through the use of phosphor screens or phosphor imaging plates from Agfa Gevaert N.V. combined with image processing and analysis, radiography can be used for many extended investigations in the traditional areas of radiography as well as for completely new applications. The solution to a series of NDT problems will be presented with the emphasis on image quality, time consummation and profitability. Especially the image quality depends on the right combination of image plate, screens, source and image processing. To get the full benefit of a digital phosphor system demands that the whole range of sources from a few keV to several MeV are at the disposal for different applications. Advantages and disadvantages of the use of different sources are discussed and the results are compared. The use of digital radiography will be illustrated through a number of applications like castings, valves, reinforced concrete, pre-stressed cables in concrete, on-stream investigations of pipes, sea cables, composites etc. Digital radiography has significant advantages compared to conventional film radiography for certain applications in terms of image quality, exposure times and possibility of detection. The FORCE Institute has for a longer period evaluated a digital radiographic system based on phosphor imaging plates form Agfa Gevaert N.V. The goal of this evaluation was to specifically point out applications suitable both technically and financially for our business in NDT. The digital radiographic system used in this investigation was the Agfa Structurix DPS system. This system uses phosphor or imaging plates which consists of barium halides to which europium in traces are added. At certain locations, europium replaces barium ions in the space lattice and makes a bivalent ionic bond (Eu2+) with halides. The cassette is then inserted into the scanner where the digital radiography scanner first removes the cover of the cassette and feeds the imaging plate into the digitizing unit. A laser beam scans the imaging plate with a pre-selected scanning resolution and the reverse reaction of the europium ions from a trivalent to a bivalent state takes places with the result of emitted light equivalent to the trapped energy. The emitted light is captured by a photomultiplier and converted into digital data by the system before it is send to the work station for post-processing. After the scanning of the image plate it is either possible to continue multiple scan or erase the last of the latent image. The cover is then replaced and the cassette is ejected to the feeding table again. It is now possible to reuse the cassette for new exposures. This process can be repeated for up to 10.000 times. The software in the workstation consists primarily of two main programmes and some secondary programmes. The first main software is the NDT Identification station, which are the database and the scanning control software. The second main software is the NDT diagnostic station, which are the query and image processing software. Included in this image processing software is a module called MUSICA, which is essential for image interpretation. MUSICA stands for "MUlti Scale Image Contrast Amplification and the basic idea in multiscale enhancement is to decompose the image into components which represent individual details, and to improve the contrast by immediately operating on these components rather than on the original image [Ref. 2]. The MUSICA contrast equalisation is the basic mode of enhancement, but it is also possible to add additional edge enhancement and latitude reduction. This is realised by concatenation during the process of contrast equalisation. The result of using MUSICA is an image with a much better perceptibility of low-contrast features of any size throughout the entire image. Furthermore the possibility of latitude reduction is very important in NDT related digital radiography especially when investigating components with complex geometries and a significant variation in wall thickness and/or material combinations. The wire IQI sensitivity for two different imaging plates (IPC and IPI) can be seen in figure 1. Fig 1: Wire IQI sensitivity for steel and aluminium compared to EN 462 part 3 for two types of imaging plates. It is evident, that the wire IQI sensitivity for aluminium is significantly higher than that for steel for both the two types of imaging plates. It is only possible to meet the requirements of a class A for steel and only by using an IPI imaging plate. There are still 1 to 2 wires to go to meet a class B depending on the thickness. For aluminium it is possible to meet the requirements of a class B with the use of an IPI imaging plate, and an IPC imaging plate can easily meet the requirements of a class A. Parts with a complex geometry like castings, valves, fittings, composites etc. Digital radiography has been used to investigate parts with a complex geometry in many different materials and as a consequence of that the necessity of using different sources and energies. It has been found that the imaging plates are suitable for use from very low energy of 10 keV and up to at least 7.5 MeV. X-ray as well as gamma ray (Se75, Ir192, and Co60) has been used. In agreement with [Ref. 3] it was found that the use of lead and steel screens in front and behind the imaging plates are essential for a good result especially for high energy sources. Figure 2 shows exposures of castings and valves in different materials exposed with different sources. Fig 2: Examples of exposures made on a steel casting, a bonze casting and an 8-inch valve. The upper two images are an example of a steel casting exposed with 300 keV, 3 mA, SFD = 850 mm for 120 sec. The thickness range was 50 mm to 85 mm. The only difference between the two images is the window levelling which displace the mean grey level value of the image. The lower left part (bronze casting) was exposed with Ir192 with an activity of 9.73 Ci for 7 minutes and 43 sec. SFD = 1000 mm. The thickness range was 20 mm to 200 mm. An equivalent exposure was made with an Agfa D7 film and an exposure time of 74 minutes. The thickness range available for evaluation is the entire range from 20 mm to 200 mm for digital radiography but only 20 mm to 100 mm with the D7 film. 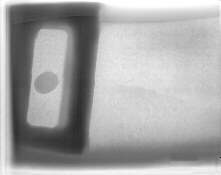 It was also possible to see the same IQI wire (Cu) with digital radiography as on the film. The lower right part is an 8 inch valve exposed with a 7.5 MeV Betatron for 180 sec. (SFD = 1200 mm). The high dynamic range of the image plate was used to its full range. Due to the small focal spot of the betatron (o.3 mm x 1.5 mm) the sharpness is superior to Co60. 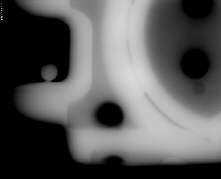 digital radiography with high energy X-ray like the betatron or gamma radiation like Co60 is an excellent NDT method for condition monitoring of valves, fitting etc. The shorter exposure times for digital radiography and the possibility of using image processing and image analysis to perform measurements made it interesting to investigate reinforced concrete. Determination of the size of cavities in reinforced concrete is of particularly interest because of the possibility of corrosion of pre-stressed cables and reinforcement in contact with these cavities. The OECD Nuclear Energy Agency[Ref. 4] also formulates a NDT detection limit for determining the minimum size of a cavity as a function of the thickness of reinforced concrete. They quantify a limit of detection: it should be possible to detect a cavity > 20 mm in diameter in a 1000 mm thick heavily reinforced concrete structure. This investigation covered thicknesses of 300 mm, 600 mm, 800 mm, 1000 mm and 1200 mm reinforced concrete with cavities of ø15 mm, ø20 mm ø30 mm, ø40 mm, ø50 mm, ø60 mm and ø70 mm. Images of these investigations can be seen in figure 3, where thicknesses of 300 mm, 600 mm, and 800 mm with cavities of ø15 mm, ø20 mm and ø30 mm are presented. Fig 3: Images of reinforced concrete in different thicknesses (from left 300 mm, 600 mm and 800 mm). Cavities with a size of ø15 mm, ø20 mm and ø30 mm can be seen in each image. All these images have been subjected to image processing (MUSICA) with emphasis on contrast enhancement. Films have been exposed to a similar density in order to compare the contrast as a function of concrete thickness. It has been found that the contrast is increased for imaging plates compared to film (Agfa FD8p) for all the images, but the difference increases with concrete thickness. It is not possible to detect the same minimum size of cavity with film compared to imaging plates. To give a good view of cavity detectability for imaging plates, figure 4 shows an image of 1200 mm thick reinforced concrete with three cavities of sizes: v20 mm with depths of 15 mm, 20 mm and 40 mm. All three cavities can easily be detected. Fig 4: 1200 mm thick reinforced concrete with three cavities of sizes: ø20 mm with depths of 15 mm, 20 mm and 40 mm seen from right to left. The necessary exposure time when using imaging plates compared to FD8p film varies with the thickness of the reinforced concrete. A 7.5 MeV betatron was used as the source. This can be seen in figure 5 where all the exposure and scanning parameters for the 5 different thicknesses are shown. Figure 5: Exposure times for film and image plate including cooling time for the betatron as a function of the thickness of reinforced concrete. These exposure times from figure 5 give approximately the same grey level value for imaging plates but a decreasing density for FD8p films. This means that the long exposure time of 3516 and 14400 sec. is not sufficient to produce a density of 2.5. For the latter the resulting density is on the limit for evaluation. where DV is the grey level value of the void in the middle of the void and DC is the corresponding grey level value next to the void. The latter is found as an average of the grey level value on both sides of the void in the same horizontal position where the void grey level value is measured. This void density factor plotted as a function of the size of the void for 4 different thickness' of concrete can be seen in figure 6. Fig 6: Void density factor plotted as a function of the size of the void for 4 different thicknesses of concrete. 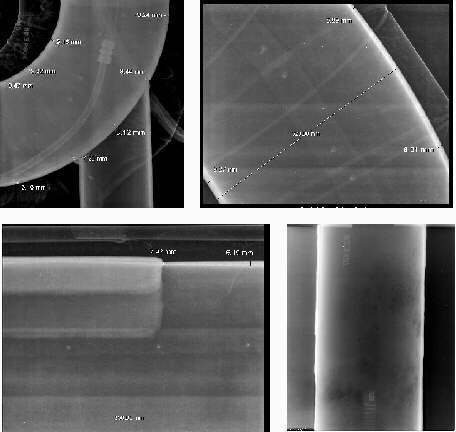 Fig 7: Four exposures of on-stream applications where digital radiography has been used to determine the residual wall thickness. Radiographic on-stream investigations of pipes for determining the residual wall thickness is a time consuming process. Not only the evaluation but also the exposure can take a considerable amount of time when using film. Digital radiography can be used to accelerate this process considerably. Figure 7 shows some examples of on-stream applications investigated with digital radiography. The upper left exposure is an 8-inch pipe bend with 80 mm of insulation. The pipe is filled with diesel. 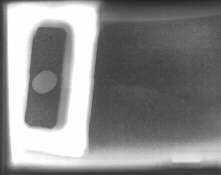 It is exposed with Ir192 as the source for 180 sec. (SFD = 850 mm). Residual wall thickness indicated by measurement. The upper right exposure is a 12-inch pipe bend with insulation filled with water (partly frozen). The pipe itself is filled with Ethylene. It is exposed with Co60 as the source for 10 minutes (SFD = 1500 mm). The lower left exposure is similar to upper right exposure. An old repair of a leakage can be seen at left. From the residual wall thickness of only 2.92 mm at the edge of the repair it is evident that a leakage will take place in the near future. The lower right exposure is an 8-inch pipe with severe corrosion on the outside. If the difference in contrast is big enough it is possible to automatically measure the residual wall thickness in seconds, see [Ref. 5]. Automatically measurement can be used in this case. In order to determine corrosion in the middle of the pipe, it is necessary to compare the measured grey level value in a specific point with a grey level value measured on a known thickness, for instance a step wedge placed beside the pipe. An example of the latter can be seen in figure 14. This is a pipe with a diameter of 200 mm and a nominal thickness of 20 mm. The corrosion is situated on the inside of the pipe. Fig 8: Internal corrosion on a pipe with a diameter of 200 mm and a nominal thickness of 20 mm. A profile line is showing an 8-bit grey level value. These grey level values can be compared to a known grey level value/thickness taken from a step wedge, which can be placed on the side of the pipe. The authors wish to thank Agfa Gevaert N.V., Belgium for the co-operation and for the digital radiography equipment made available for the FORCE Institute in this evaluation. G. Rihar, J. Rant, J. Stade, Application of imaging plates in the radiographic examination of welded joints, Welding in the World, Vol. 43, no. 5 1999, p. 6-11. P. Vuylsteke and E. Shoeters, Image processing in computed radiography, DGZfP Proceedings marts 1999, p. 87-101. U. Ewert, Y. Onel, U. Zscherpel, J. Stade, P. Willems, Industrial Application of Computed Radiography with Luminescence Imaging Plates, 7th European Conference on non-destructive testing 26-29 May 1998, p. 2725-2732. K. Marstboom, Computed radiography for corrosion and wall thickness measurements, INSIGHT Vol. 41, No. 5 1999, p. 308-309.